Panoramic view o the wastren pairt o the ceety an the port o Piraeus. Piraeus (/[unsupported input]paɪˈriːəs/ or /pɪˈreɪ.əs/; Greek: Πειραιάς Peiraiás [pireˈas], Auncient Greek: Πειραιεύς, Peiraieús, pronounced [peːrajěːu̯s]) is a ceety in the region o Attica, Greece. Piraeus is locatit athin the Athens urban aurie, 12 km soothwast frae its ceety center (municipality o Athens), an lees alang the east coast o the Saronic Gulf. 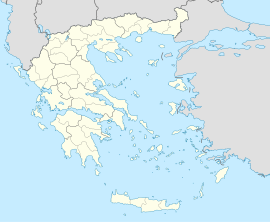 Accordin tae the 2001 census, Piraeus haed a population o 175,697 fowk athin its admeenistrative limits, makkin it the third lairgest municipality in Greece an the seicont lairgest athin the urban aurie o the Greek caipital, follaein the municipality o Athens. 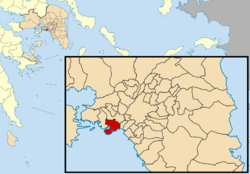 The municipality o Piraeus an several ither suburban municipalities athin the regional unit o Piraeus form the wider Piraeus Urban Aurie or Greater Piraeus, wi a total population o 466,065. ↑ 1.0 1.1 De Facto Population of Greece Population and Housing Census of March 18th, 2001 (PDF 39 MB). National Statistical Service of Greece. 2003. ↑ National Statistical Service of Greece (2002). Στατιστική Επετηρίδα της Ελλάδος 2002 (PDF) (in Greek). National Statistical Service of Greece. p. 54. The table includes the urban areas of Greece, officially defined by the National Statistical Service of Greece, powered by the Ministry of Finance of Greece. The municipality of Piraeus and its greater area belong to the Athens urban area or Greater Athens (Πολεοδομικό Συγκρότημα Αθηνών). ↑ "Saint Petersburg in figures – International and Interregional Ties". Saint Petersburg City Government. Retrieved 2008-10-23. Wikimedia Commons haes media relatit tae Piraeus. This page wis last eeditit on 5 Mairch 2018, at 00:49.